Retaining walls, footpaths, steps, pillars, posts, paving – all these elements combine to form a 'hardscape'. Simply put, when the natural soil, gravel, or sand is covered over with man-made materials, what you have is a 'hardscape'. 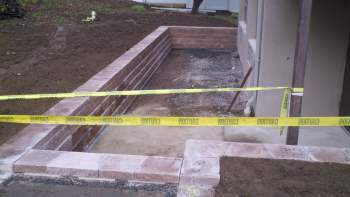 AAP Construction is pleased to provide attractive hardscaping at equally attractive prices. A hardscape is specially important in areas that suffer from water shortages or have poor soil. Build a pretty 'scape once and for all; then you need expend little or no energy and costs toward maintenance! Let's begin with the basics: cement and concrete. For each particular aspect of hardscaping, AAP Construction will prepare the cement just right. Then, we will mix the correct proportion of crushed stones, gravel, sand and such with the cement to make the appropriate type of concrete. It is because of attention to details like these that we have established our reputation since 1993. Our attention to detail extends to design choices for you. Your hardscape can have a concrete emphasis, a brickwork emphasis, or a stonework emphasis. Feel free to call us at (973) 298-1013 and we'll be glad to lay out your options, including budget deluxe options such as inexpensive marble-textured pavers, but with flourishes and touches of expensive Greek Marble. Wow! We can provide these options as a result of the experience we have garnered since 1993. We'll suggest touches beyond what you might expect: how about a mini-waterfall over moss-covered rocks or an artificial pond with small footbridge? Along with our range of options go a range of fair prices with the unifying thread being our watchword: value-for-money. Find out more – call AAP Construction today at (973) 298-1013 for your free quotes!